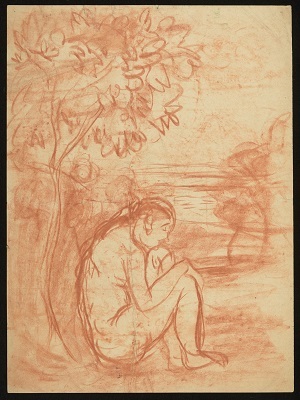 It is very easy to get lost in imagining the world, people and stories behind the pieces in the Angelica Garnett Gift and this preparatory sketch by Duncan Grant for a mural designed by both Grant and Vanessa Bell is no exception. 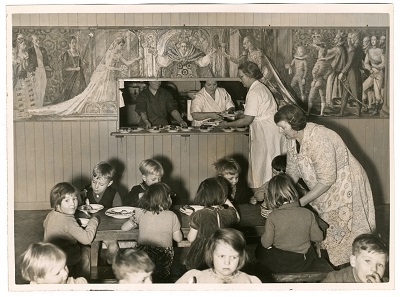 The mural was commissioned by the Council for the Encouragement of Music and the Arts and the British Institute of Adult Education in 1943 for the dining hall of Devonshire Hill School in Tottenham. The design by Grant and Bell depicted the fairytale Cinderella, and was completed during World War II. Sadly, the mural no longer exists, having been dismantled and destroyed during renovation works at the school. Perhaps even more regrettable is that few people are aware that it existed at all. Like many other decorative works by Grant and Bell all that now remains are a few photographs, newspaper cuttings and preparatory drawings, such as one discovered during the last week in the Charleston Attic. 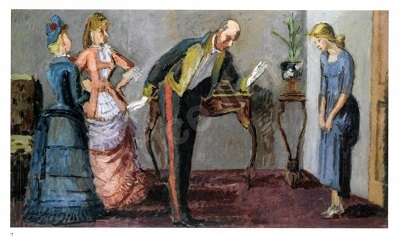 Maynard Keynes, or Lord Keynes as he was then known, described the murals at their unveiling as ‘rather humorous, deliberately light, pleasing and anecdotal.’ This expressive sketch perhaps shows Cinderella being presented at the ball where she was to meet her Prince Charming. The theme of Cinderella lends itself well to the work of Grant, given his interest in theatre and costume design. The Committee from the British Institute were also conscious that the general public should have access to the murals and as a result for one week in August the public were invited to the school each evening from Monday to Saturday, 7-9pm, as part of the Holidays at Home Programme. There were several initiatives during the Second World War for the creation of arts in Britain. As early as 1940 government officials had identified a link between public moral and available programmes of art. The Council for the Encouragement of Music and the Arts aimed to foster the arts through state funded programmes and looked towards a Britain in peacetime where art would become an integral part of everyday life. Kenneth Clark, a long term supporter of Grant, Bell and the Bloomsbury group, was a government official during the war and stressed that what was called for was ‘something to occupy peoples minds,’ and he was determined that the government ‘take some active part in stimulating activities of this sort.’ Indeed it was a result of this initiative and the subsequent interest in the arts as a whole that led to the formation of the Arts Council in 1946. 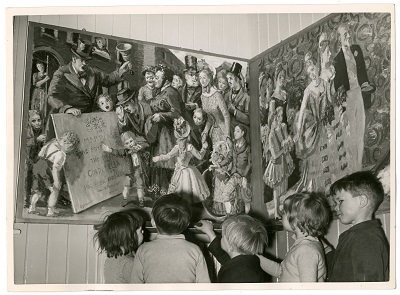 Cinderella was the second joint commission that Grant and Bell undertook during the Second World War; the first and most documented being that for Berwick Church, these completed murals being still in existence today. In 1939 both artists had joined the Society for Mural Painters and had been represented at the Society’s first exhibition at Tate with photographs of their decorative schemes. Although such projects were perhaps sparse during the war years, Bell and Grant continued to work and produce art between commissions. 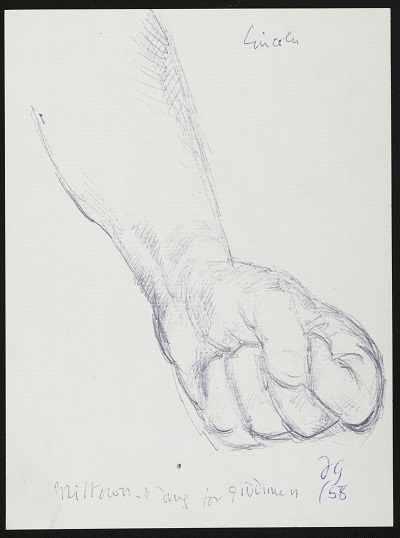 Grant travelled to Plymouth as a war artist to depict the men defending Britain as gunners whilst the Tate negotiated the acquisition of his large painting Angelica Playing the Piano and Bell arranged an exhibition of new works with the Leicester Galleries amongst other projects. We now know today that this was not to be the case. As with so many decorative schemes by Grant and Bell the mural has been a victim to changing taste and spatial needs, the dining room where it once was such a prominent and charming feature now serving the function of an assembly hall. 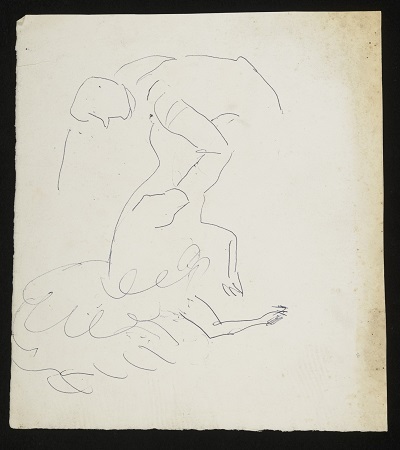 Despite the relative obscurity of the scheme sketches for the mural remain and one such piece ‘Cinderella puts on the shoe,’ by Bell is currently in the possession of Bonham’s auction house. Even though it is important to remember this mural as an example of the artistic talents and storytelling abilities of both Grant and Bell, it is also vital that we consider it as an example of the government’s desire to bring beauty and hope into the often desolate and desperate lives of communities during the Second World War. 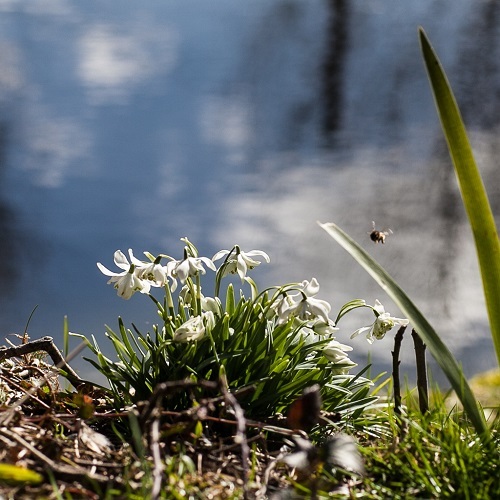 Spring has well and truly sprung at Charleston; the garden is full of blooms, the new season’s visitors are exploring the house and the sun has been shining for days on end. There are new arrivals too; lambs and calves have been spotted in the fields surrounding the house and, for a few days last week, a brood of ducklings could be seen enjoying the pool in Duncan Grant’s Folly. In almost perfect harmony, the Angelica Garnett Gift has been similarly full of new life over the past few weeks. 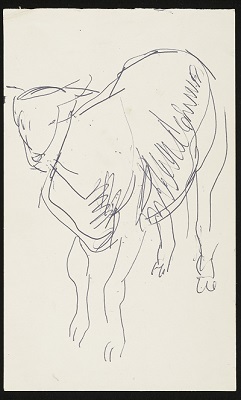 In the archive boxes in the Attic Studio we have uncovered endless dog-eared drawings and yellowing newspaper clippings of farm animals, made or collected by Duncan Grant. From detailed sketches capturing the likeness of a cow’s head and the fluffiness of tiny chicks, to hasty records of sheep being sheared by strong farm-hands and grainy photographs of shepherds with their flocks, this extensive collection of imagery provides an evocative snapshot of rural life at Charleston when Bell and Grant lived at the house. As discussed briefly in previous posts here and here, many of these drawings and clippings were created and used by Grant for his mural commission in the St. Blaise Chapel at Lincoln Cathedral, completed in 1958. A theme of sheep and wool is at the centre of the scheme, which includes depictions of Christ as the Good Shepherd, St. Blaise; the chapel’s namesake and patron saint of wool combers, sheep shearers, and ships being loaded with bales of wool in 15th century Lincoln. The city had been at the centre of Britain’s medieval wool trade, therefore this combination of local history and industry with spiritual examples was considered a suitable subject for a new mural commission by the Dean and Chapter of the cathedral. As one of Britain’s foremost artists and mural painters at the time, Grant was invited to undertake the job. After the theme had been agreed and commission confirmed in 1954, Grant set to work on the designs in his studio at Charleston. In addition to drawing animals and farm labourers from life in the fields surrounding the house, Grant also used his friends and family to model for the figures in the scheme. 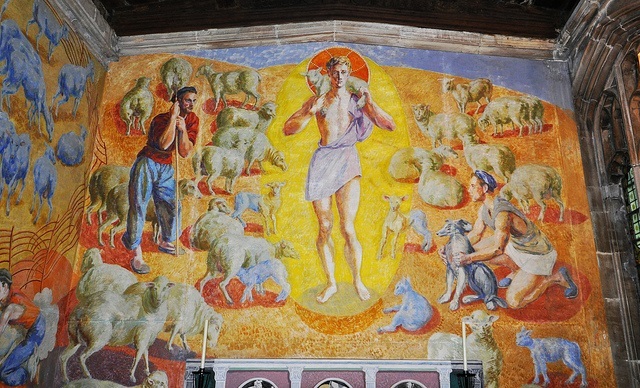 It is thought that Vanessa Bell and Angelica Garnett are included as medieval women, however it is Grant’s friend Paul Roche who is so obviously captured as Christ the Good Shepherd, and used as a model for the sheep shearers and muscular workers loading the ship with wool. Roche recalled having to pose for Grant in uncomfortable positions and with all manner of cushions and blankets slung over his shoulders in place of a lamb. A number of the resulting studies have been found in the Gift, including some with annotations by Grant denoting their intended use. St. Blaise Chapel murals by Duncan Grant. Image sourced here. The reasons behind the murals’ demotion into obscurity during these years remain unclear, however a number of scholars have argued that the realism and physicality of the figures – confirmed by the recognisable portraits of Grant’s own friends, family and lovers in the guise of historical and religious figures – was what led to their unpopularity. His depiction of Roche as a young, muscular, and clean-shaven Christ was particularly challenging and at odds with established representations. 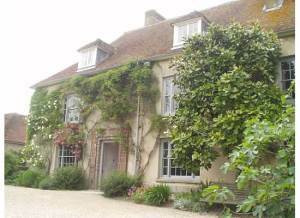 As we know that Grant studied the people and animals around his Sussex home for the scheme, his conception of ‘everyday life’ can be seen to be that lived at Charleston; an experimental, bohemian existence that was at odds with what many, especially conservative members of the congregation, would have considered ‘normal’. 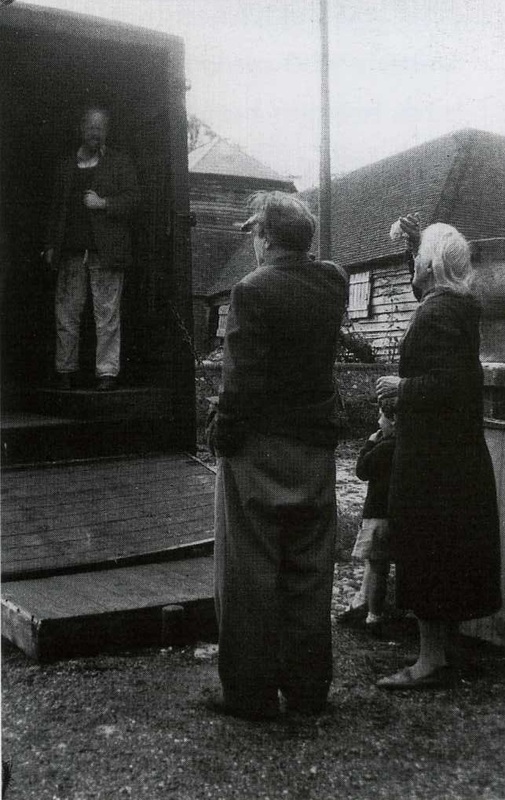 With an explosion of public interest in the Bloomsbury group’s controversial lifestyle following the publication of Michael Holdroyd’s biography of Lytton Strachey in the late 1960s, perhaps the world depicted on the walls of the chapel suddenly became too intimate and suggestive, and therefore a source of embarrassment for the Church authorities. About this we can only speculate. 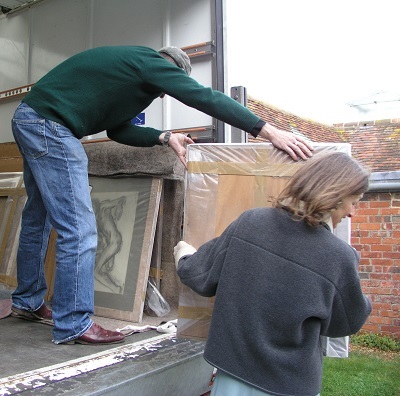 Without an inkling of their later fate, Grant, Vanessa Bell, Quentin Bell and his four year old son, Julian, watched the finished murals depart Charleston for Lincoln by lorry in August 1956. Quentin’s wife, Anne Olivier Bell, captured the scene in this wonderful black and white photograph below, which accompanies a remarkably similar image of the Angelica Garnett Gift returning by lorry to Charleston in 2008. 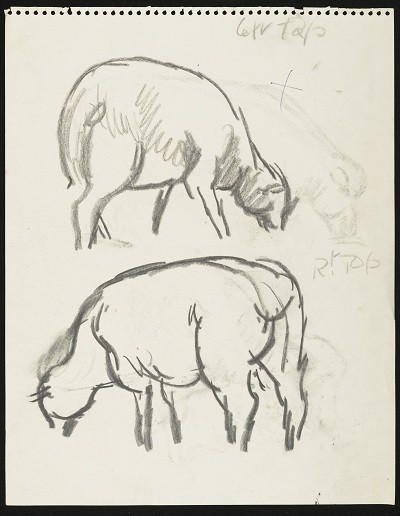 Nestled amongst all manner of paintings, sketchbooks and boxes of loose works were these fascinating preparatory drawings of animals and farm labourers; snapshots of rural Sussex life and documents of one of Grant’s most intriguing – and controversial – commissions. The Charleston Attic is famous! 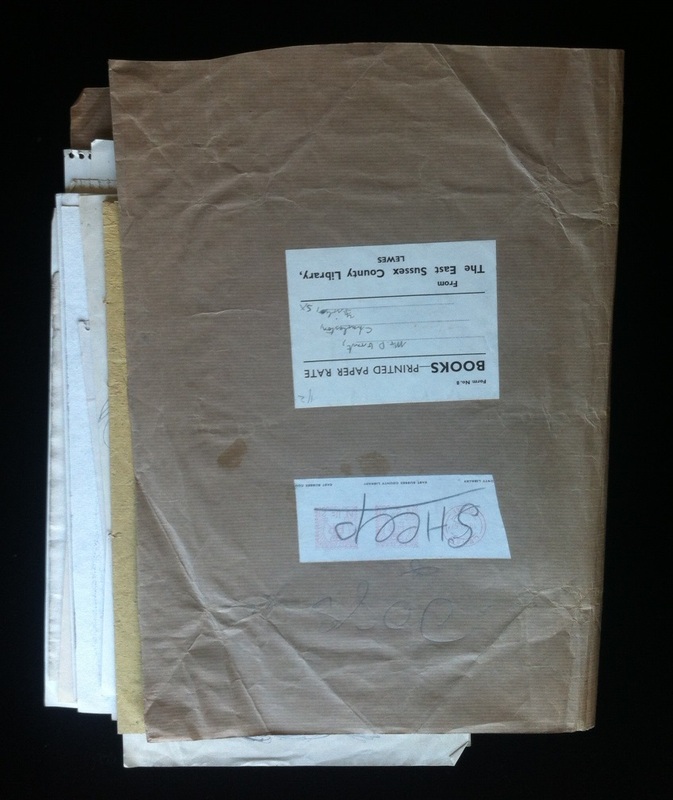 Thanks to our friends at Blogging Woolf for supporting our project. Oh, the lovely connections we make in the world of Woolf. This time, the connection gives us all a behind-the-scenes look at Charleston, the Sussex site known as Bloomsbury in the country. 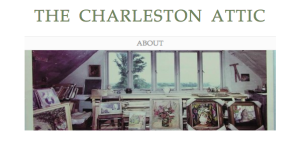 Alice Purkiss, a curatorial trainee at The Charleston Trust, contacted Blogging Woolf via a Facebook message last week to ask that we help publicize The Charleston Attic, a blog put together by Purkiss and fellow trainee Dorian Knight. With Charleston once again open and welcoming the curious and the charmed to the home of Bloomsbury, the investigation in the attic into the lives and works of its artists and residents continues. All members of the Bloomsbury group placed a high value upon friendship and we see this mutual trust and respect represented in their work as they continued throughout their careers to create records of each other almost obsessively in written word and image. 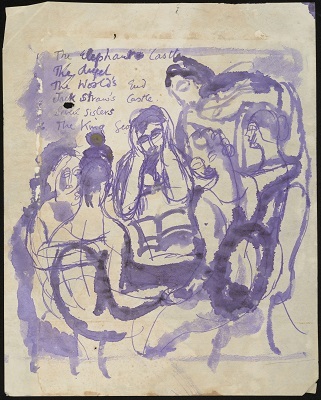 We can see this desire to capture what Virginia Woolf described as the familiar discourse between ‘congenial spirits’ in this intimate ink drawing presumed to be made by Duncan Grant. Multiple readings can, and have, been made of this work and this blog will be written under the assumption that the image depicts a group of mixed gender engaged in intimate discussion within a public space. Having rejected the restraints of Victorian society and questioned boundaries set by the establishment, the group’s members refused to partake in conventional discourse and instead debated ideas of liberty, common enjoyment and the pursuit of art. 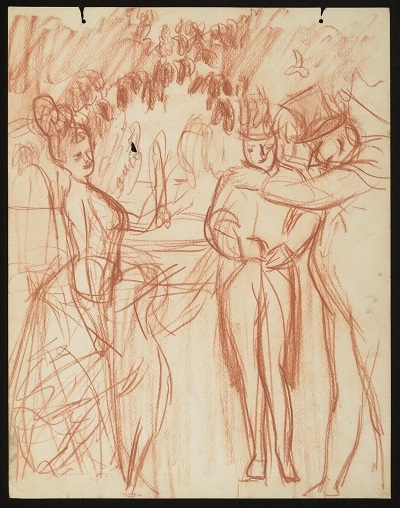 This drawing, completed in a hasty and expressive nature, seems to focus more on ‘setting a scene’ than creating a likeness of individuals. Furthermore, the list of London pubs embedded in the image gives a sense of a group of friends meeting to drink and talk; banishing the ‘drawing room prattle’ in their consideration of modern life in an informal public space. In addition, this image lends itself to a consideration Charles Baudelaire’s concept of the flâneur. 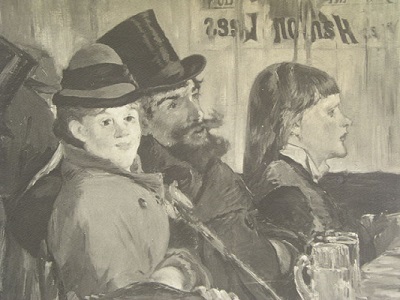 In his book, ‘The Painter of Modern Life’ published in 1863, Baudelaire argued that an artist should at heart be a passionate spectator of modern life and that this spectacle was best observed in an urban crowd. The idea of the flâneur was of one gaining understanding and finding inspiration, of always being at the centre of the world whilst allowing oneself to remain hidden from it. 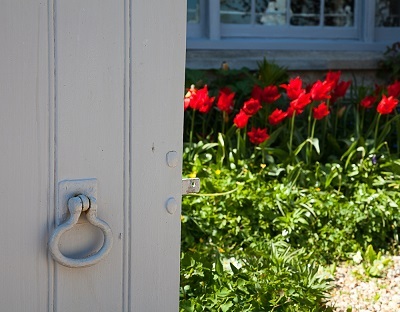 The Bloomsbury group, with their radical political ideas of what it meant to be modern were themselves passionate spectators, yet they found relative sanctuary in their personal relationships and private country retreats such as Charleston. The flâneur became a recurrent theme in the paintings of many Impressionist artists, most notably Renoir, Degas and Manet. Their art showed men meandering down streets and observing infinite scenarios of life whilst sat in cafes. 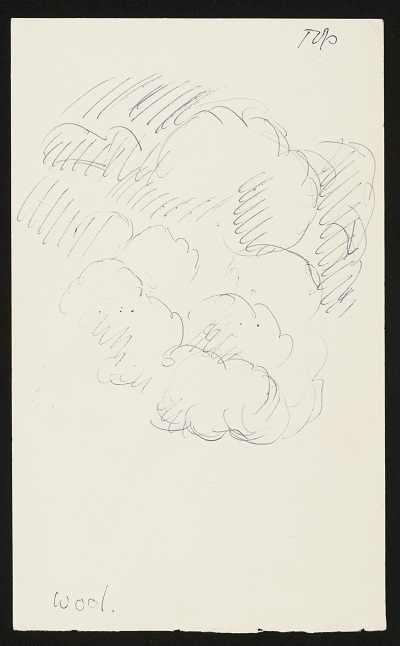 Grant’s ink drawing, recently uncovered in the Angelica Garnett Gift, is an example of how the idea of the flâneur also became part of life and an inspiration for the Bloomsbury artists, even if this was an unconscious decision. The above reproduction of Edouard Manet’s ‘Au Café’ was collected by Duncan Grant and Vanessa Bell for personal reference and is now part of Charleston’s collection. Bell and Grant regularly sketched from life on their various travels abroad, the idea of painting ‘en plein air’ (painting outdoors) having originating with the Impressionists. Their drive to record the world and people around them was not limited to the artistic materials at hand. 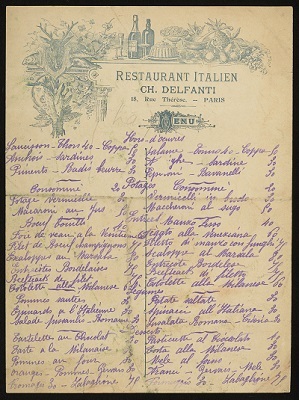 Whilst there are numerous sketchbooks and loose works on paper depicting urban scenes and lives in the Gift, there are also hasty sketches made on the backs of menus, hotel letter paper, foreign receipts and maps. These examples show that to them, modern life and art were intrinsically linked and that observation of one lead to creativity in the other. It is also interesting to note that Baudelaire’s flâneur, a product of modernity, is specifically male and that the female experience of viewing and being viewed was entirely different within society’s constricts of gender at that time. Bloomsbury women rejected the strict etiquette of previous generations such as Baudelaire’s and rejoiced in the idea of life without a chaperone. Feminist art historians have reconsidered the role of the female flâneur – or flâneuse – by looking at works by Mary Cassatt and Berthe Morisot. They argue that these artists did depict women observing the intricacies of modern life through a female gaze equal to that of their male counterparts. Bell’s painting ‘A Conversation’ shows three women in earnest conversation before a curtained window though which a garden is visible. Although these women are indoors, the image does show their ability to observe, without restraint, the outside world and it is a great example of how Bell explored feminine relationships, conversation and experience. 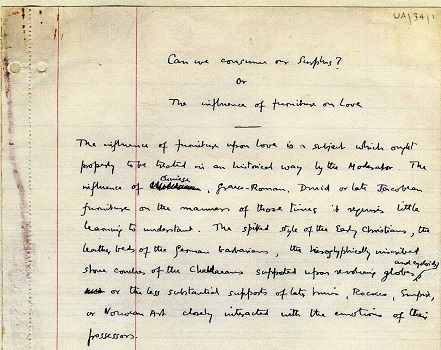 Similarly, in her novel Mrs Dalloway, Woolf casts her female lead as the flâneur. Through describing the routine and experiences of one day in the life of Clarissa Dalloway, she becomes the spectator of death, love, change, friendship and considers the role of society-women and the void that can exist between people. This blurring of boundaries between public, private and gender moves away from Baudelaire’s understanding of the flâneur and transforms it to something more liberated and in-keeping with the ideas and morals of Bloomsbury. 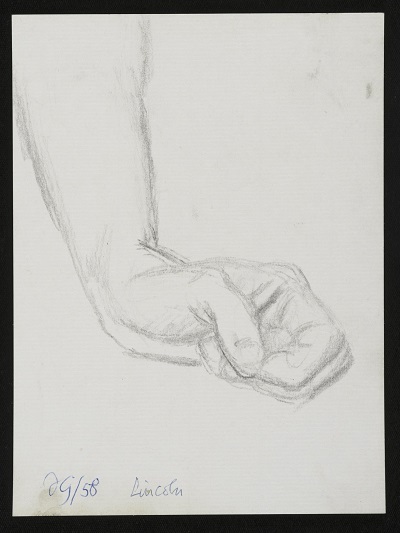 Grant’s inclusion of women in the ink drawing can be seen to reiterate and reflect upon the fight for liberty in all aspects of modern society; a quest with which all members of the Bloomsbury group were concerned. Following on from Dorian Knight’s talk, ‘Excavating Bloomsbury’, curatorial trainee Alice Purkiss presented her research paper on the Angelica Garnett Gift at Charleston last week. 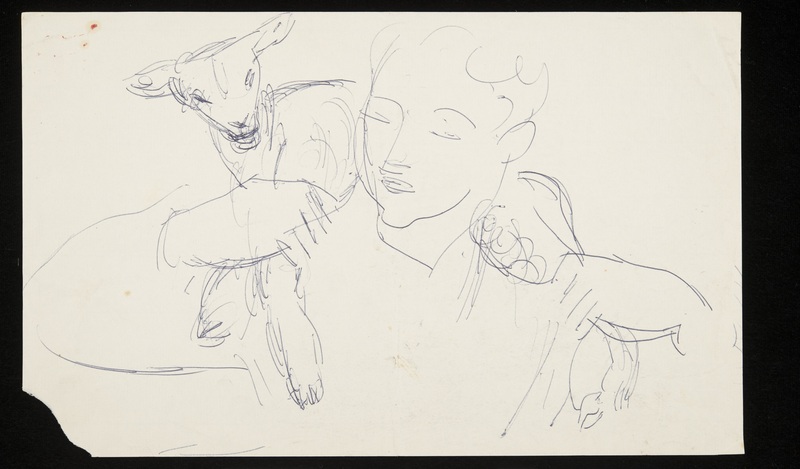 Drawing upon examples uncovered in the Gift and items from Charleston’s collection, Alice explored the unique breed of modernism conceived by the Bloomsbury artists and embodied by Charleston; by its rooms, its inhabitants, and its contents. John Maynard Keynes, essay, ‘Can We Consume Our Surplus? or The Influence of Furniture on Love’, JMK/UA/34, © King’s College, Cambridge. Does it really make a great difference to us in what rooms we live, whether we clothe them with chintz or with velvet, whether they are hard or padded? That it makes a difference in some ways, is obvious. These things affect our pleasure and our convenience. But do they do more than this? Do they suggest to us thoughts and feelings and occupations? It is believed that Keynes wrote the paper in 1909 for presentation to The Apostles rather than for academic assessment or professional publication. This was a secret society of students at Cambridge University who met weekly to discuss and debate a whole host of topics, often with much humour and joviality. 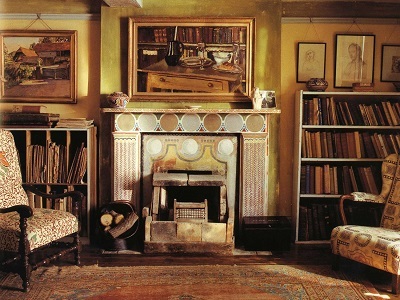 A number of other Bloomsbury group members were also Apostles, including Desmond MacCarthy, Leonard Woolf, Lytton and James Strachey, and E.M. Forster. Light hearted, amusing and at times risqué, it is not hard to picture Keynes presenting this unusually titled essay to the assembled students over coffee and ‘whales’ – the group’s name for sardines on toast. However, despite its apparent silliness, Keynes does raise a number of interesting questions in the essay that are relevant to a consideration of Charleston; a place where the author himself would become a regular and welcome visitor. Focussed upon three chairs in Clive Bell’s study at Charleston, Alice’s talk explored Keynes’ idea of ‘thoughts and feelings and occupations’ both influencing and being embodied by creative activity at Charleston. 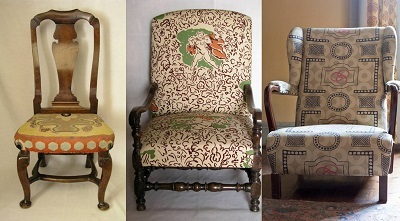 As hybrid objects combining old furniture with modern fabrics designed by Duncan Grant, Vanessa Bell and Roger Fry, the three chairs can be seen to embody Bloomsbury modernism; a progressive creative expression which reinvented and revised existing objects, sources and ideas, rather than enacting a complete break from the past as promoted by other modern artists and groups in the early twentieth century. Discussing the influence of Bell and Grant’s Victorian upbringings, their working methods and domestic life at Charleston, Alice offered an alternative insight into Bloomsbury art and life that is exemplified even by the furniture which fills the artists’ home.